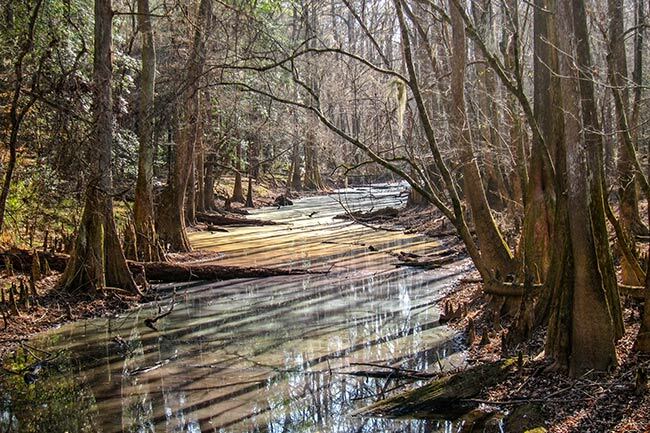 Congaree Creek Heritage Preserve is located in Cayce – just outside of Columbia – where it borders the Congaree River. Its 627 acres honor over 12,000 years of history. A portion of the historic Cherokee Trail still runs through the preserve. Both the creek and the river are named for the Congaree Indian tribe. The Cherokee Trail once led from the Appalachian Mountains to the East Coast. 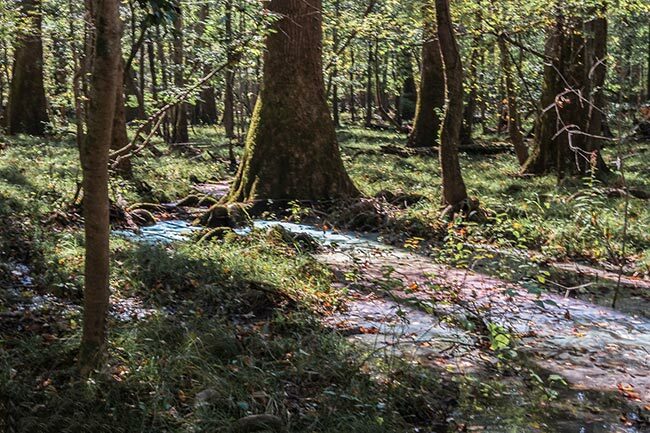 Archaeologists have found tools, pottery, and arrowheads in the Congaree Creek Heritage Preserve which that belonged to Native Americans who traveled on the path. On certain days, during the winter months, visitors are treated to one of nature’s brilliant displays. The normally dark and murky waters of the swamps here are turned into a spectacular display of vibrant colors creating what some have dubbed as rainbow swamp as seen in the photos above and below. Experts have said that this phenomenon occurs when the leaves of bald cypress tress drop into the water, as they begin to decompose, they create a film on the surface of the water, once the sunlight hits the water at the right angle, the rainbow effect occurs. Coupled with the reflections of the trees and sunlight, it is quite a breathtaking sight. 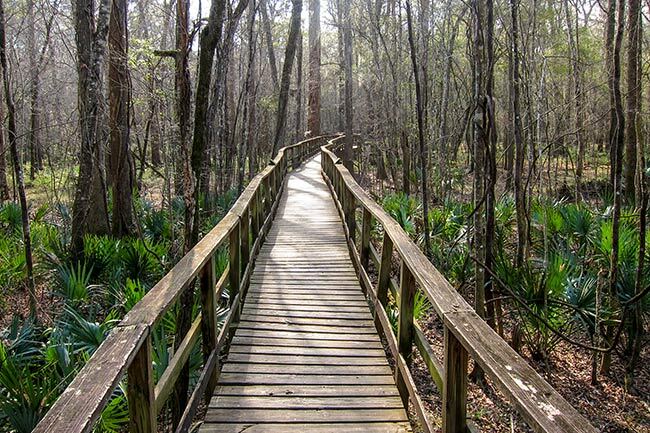 There is a three-mile hiking loop at the park where you can enjoy a variety of flora and fauna. The Guignard Brickworks Trail runs through part of the preserve. Designated a Millennium Trail, it celebrates the past and the future through natural settings. 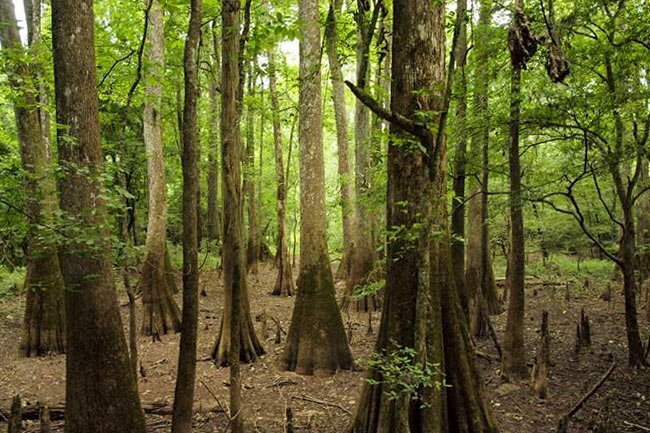 If you would like to expand your adventure, visit Congaree National Park – the first national park in South Carolina. Close to the preserve, the park is a great place to paddle, tube, or fish. So tranquil done up in autumnal hues of brown and yellow-golden.